Name the 5 largest countries on these lines of longitude. Nice idea! Why leave out the 180th meridian though? Mongolia is not larger than Australia. And Burkina Faso is also not bigger than U.K. This is looking at the longitude, not at the area. It looks like 150°E clearly intersects with Australia. That was a fun quiz, made a bit harder by the format of the longitude lines being rows instead of columns. Had to turn my mental map on its side to draw the lines. This was only due to formatting difficulties. Glad you enjoyed the quiz! Nice quiz, can't believe i forgot DRC though! Indonesia is larger than the Philippines. 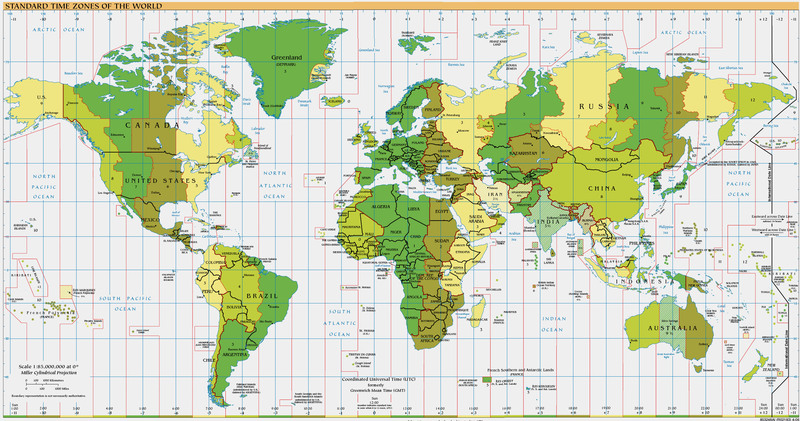 What about swapping rows and columns so that longitude goes 'west to east'?! Thanks Bolivia is there above Venezuela. I first did this but it looked very messy because the countries' long names went past width 730! The 150°E parallel doesn't make landfall anywhere in Fed States of Micronesia, and neither does the 180° parallel with Kiribati (where the islands either side of the 180° line are over 600 miles apart). Maybe it's worth clarifying in the instructions that the line doesn't have to cross a country's land-mass, just its territorial waters? Update on Kiribati - its islands are so far from the 180 degree parallel, both westwards and eastwards, that the 180 degree parallel is outside even the country's 200 mile economic zone. So I don't think we can say the 180 degree parallel passes "through" Kiribati. Kiribati's country coordinates, including Exclusive Economic Zone data, are available here. I can't believe I totally blanked completely on all of Oceania, as well as Indonesia and Philippines. My mind wasn't thinking about islands being the largest countries, I guess. Stupid Mercator Projection, makin' me think that countries are huge. I need a map... or a good link to one. If only the mainland is included why is Fiji on here? Its largest island is all west of the 180° meridian. Quiz description says "Mainland countries in which a meridian passes through their offshore islands are excluded." Fiji, on the other hand, is an island country, so it's not subject to that restriction. I love and hate this game. How is it possible? Why doesn't 'F. S. Micronesia' show up in green like the other countries when taking the quiz?